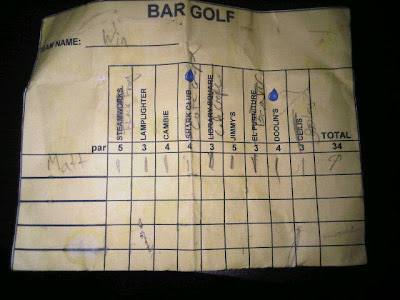 This past weekend a friend of mine introduced me to the wonderful game of Bar-Golf. I've never particularly enjoyed golf, in part because I have never been any good at it. As it turns-out, I am practically the Tiger Woods of bar-golf (minus the whores). Finished up 25 under par. Bar-golf (Pub Golf to some) is loads of fun and a highly enjoyable way to explore any city while visiting full spectrum of bars in a short amount of time. I think Bar-golf is a great activity for travellers and tourists because you are able to spend the day walking around a city while getting a little drunk. Even a 'tourist in your own city', as I was this past weekend can discover new areas and maybe a new favorite bar. Keep track of your score. After 9 bars, the one with the lowest score wins!